The first thing you notice with DR Drop-Down Tuning Guitar strings is how stable they are. 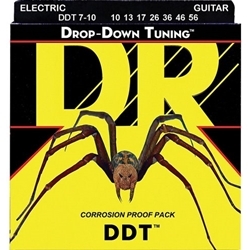 DDT strings maintain their intonation at lower tunings far better than other strings you may have played or heard. Players say DR DDT guitar strings are so stable it is almost eerie. Now you can "stand and deliver" in-tune notes at lower pitches that are clean and clear-plus you can drop tune with confidence and accuracy. You'll be surprised how few adjustments you'll make to change tunings and will be even more surprised how well DR Drop-Down Tuning strings lock into tune.